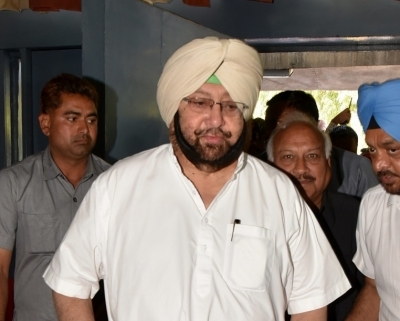 Chandigarh, Oct 7 (IANS) Punjab Chief Minister Amarinder Singh on Sunday said that no one whose name figured in an ongoing probe into the 2015 cases of sacrilege of Guru Granth Sahib will be spared if they were found involved. Addressing a Congress rally in Lambi, the native village of former Chief Minister Parkash Singh Badal, Amarinder Singh accused the then SAD-BJP government led by Badal senior for not doing enough to stop the sacrilege incidents. He claimed that the then government ordered police firing on peaceful protesters in Bargari, killing two youths. “After the Bargari incident, the Akali Dal leadership has been exposed. The Akalis have lost support of the people,” Amarinder Singh said. On Sunday, the state witnessed two big rallies and a protest which saw the three main players of Punjab politics — the Congress, SAD and Aam Aadmi Party (AAP) — trade barbs. In ‘Jabar Virodh’ rally held in Chief Minister Amarinder Singh’s hometown Patiala, SAD President Sukhbir Singh Badal, who was the Deputy Chief Minister in charge of Home portfolio when the sacrilege incidents occurred, said that the Punjab Congress leadership was “trying to weaken the Sikh religion”. “Certain forces are trying to weaken the Akali Dal and the ‘panth’ (Sikh religion). We have to be beware of the designs of such forces. Our party and our then government felt sad over the unfortunate sacrileges. The SAD is being blamed for these incidents (by the Congress leaders) by repeatedly telling lies and misleading people,” Sukhbir Badal said. Sukhbir Badal said that the Congress had failed to deliver on any of the tall promises — loan waiver to farmers, jobs to every family in Punjab, eradication of drugs and providing mobile phones to the youth. Punjab BJP President and MP Shvet Malik said that there was no government and governance in Punjab ever since the Congress came to power in the state in March 2017. “The government is invisible and the Chief Minister and his Ministers are invisible. Congress legislators are trying to hide themselves,” Malik said. Various Congress leaders targeted the SAD, particularly the Badal family, at the Lambi rally for sacrilege incidents. The Aam Aadmi Party held a march on Sunday from Kotkapura town to Bargari village in Faridkot village to protest against the sacrilege and subsequent police firing in October 2015 on those protesting against the incidents.